When you buy blueberry plants from DeGrandchamp’s, you are buying from professionals. Blueberry farming is our business, and our goal is to combine years of commercial blueberry farming experience with each customers’ specific needs. We offer a full line of plants; from early to late varieties; and know first hand what varieties are best for fresh pack, U-pick, or commercial growing. We take great care and pride in growing our plants. All our blueberry plants are container grown for stronger and healthier root systems. The result is a plant that has better first-year growth and quicker fruit production. You can plant with confidence too; because all our plants have been “virus tested” for diseases. DeGrandchamp’s is pleased to have available “virus tested” blueberry plants. We encourage you to plant them because they are superior plants. DeGrandchamp Blueberry Farm is proud to be a participating nursery in the state of Michigan “virus tested” blueberry program. This involves having stock plants tested for blueberry viruses and maintained virus-free in screen houses. We then go a step further and have these plants micro-propagated through tissue culture. When you order blueberry plants from DeGrandchamp’s, you can be assured of prompt and courteous service. The most important part of our business is our customers. That’s why when you call to order, we take time to talk and find out what plants best fit your needs. We may even have a variety you haven’t considered. Our plants will arrive healthy and ready to grow. So call us…we are the Blueberry Professionals! 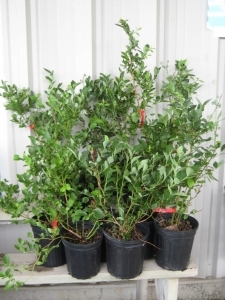 Our nursery stocks Blueberry and Cranberry plants for the commercial and home gardener. Click on the catalog to browse through growing advice and information. The plant site is important. You should avoid standing water and saturated soils. Blueberries require good drainage. Blueberries will tolerate partial shade but best fruit production will be in full sun. Please keep in mind that the planting hole you are preparing is where the blueberry plant will live in for its entire life. Dig a planting hole at least 24″ in diameter and 18″ deep. The planting hole should contain at least 50% acidic organic mulch (peat moss, rotted sawdust, composted pine bark) with the native soil. Blueberries require an acidic soil pH 4.0-5.5. Blueberries should not be planted any deeper than the top of the root ball. In heavy clay soils, drainage is critical. Work the organic mulch in the top 3″ of the soil and place the blueberry plant on top of the ground. Backfill with your organic mulch 2 feet around the plant and to the top of the root ball. Planting the blueberry high gives the plant the drainage it requires. Apply 2-3 inches of acidic mulch annually. Fertilizer should be applied at low rates using an “acid-loving” fertilizer. Fertilizer and sulfur are available on the ‘Home Gardener’ page. Blueberries require constant moisture in their root zone, but can’t tolerate saturated soils for long periods of time. The organic mix provides good moisture retention and sufficient drainage. During dry, hot weather blueberries may require watering several times a week. The following information was provided by Michigan State University and the MSU Extension. Please visit their site for more valuable information!